CREDITS: Sasha has performed more than 1000 shows. Sasha the Fire Gypsy is an incredible, accomplished fire performer who combines performance, choreography, theatrics, drama, movement, and dance to bring fire performance to the highest level of amazement and professionalism! Each movement of the fire and the dance of her body flowing with the beat of the music will hypnotize any crowd! Sasha performs a multitude of different fire acts including unique, custom made props to create a show that will leave your guests talking for years to come! The way she moves with the fire brings a whole new meaning to the term "Fire Dance" as she truly manipulates the flame as if it is an extension of her own body. If you are looking to amaze, look no further! Your guests will watch in amazement as Sasha puts fiery torches out with her mouth, dances with a blazing hula hoop, executes mind bending backbends while spinning balls of fire just inches away from her face! The crowd leaps back when they feel the heat while Sasha breathes huge bursting plumes of fire! Heat up any event with a one-of-a-kind performance by the Fire Gypsy! Shows can be performed Inside OR outside as long as there is at least a 10x10ft area and the ceilings are at least 9ft tall. Fire Eating, Fleshing, Vapor Holds, and Tongue Transfers. Fire Hip Belt with Palm Torches, Fire Fans, Fire Hula Hoop, Fire Poi, Fire Ropes, Fire Staff, Fire Sword, Fire Breathing, and MORE! Sasha also has custom creations such as the Fire Headdress, Fire Collar, and other never-before-seen creations in the works! As a metal fabricator, blacksmith, and welder, she is also capable of creating custom fire props, fire signs, fire artwork, and anything you can imagine for any theme and event! Grinder acts (wearing a metal corset and using an angle grinder to create sparks). LED light shows with LED Hula Hoop, LED Poi, Blacklight body paint. Sasha is also a Mermaid and underwater performer! Perfect for kids birthdays, pool parties, aquariums, lakeside and oceanside events, and anywhere you want your imagination to run wild! Sasha is based in Long Island and New York City, but travels anywhere your heart desires! Sasha also works with a variety of other fire performers, stilt walkers, glass walkers, jugglers, sword swallowers, sideshow performers, burlesque artists, coney island performers, and MORE! With all of her resources, she can create a STUNNING show! Each show is created specifically for YOU! You could choose to have a 30 minute show, two 10 minute shows, two 15 minute shows, three 10 minute shows, the possibilities are endless! Sasha has enough acts to perform for 45 minutes straight. Add more performers, and we can create an extravagant show to remember! Sasha has a wide variety of costuming to choose from to match any theme of your event. 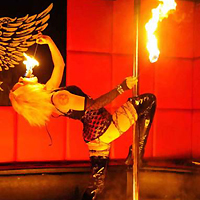 Fire Gypsy Productions follows the highest safety standards and protocols for performing with fire. Fire performance should look dangerous, not be dangerous. Sasha has specific liability insurance through Specialty Insurance Agency. This liability insurance covers up to $3,000,000 including damage to property, bodily injuries, medical expenses, etc. Sasha can also acquire a specific certificate of insurance for a venue. Please give 48 hours notice of request to process through Specialty Insurance. Sasha uses a double bucket fueling station which ensures a safe and foolproof fuel dump. Sasha only uses fuels safe and appropriate for fire performing. All fuels are clean burning with limited smoke and fumes. Each tool is squeezed out to reduce excess fuel. By doing this, it eliminates any fuel drip or spin off spray. Sasha thoroughly inspects each tool before each use for any flaws or loose connections, ensuring that each tool is safe to perform with. Sasha is always accompanied by a professionally trained fire safety. The fire safety mans the fueling station, guides security through protocols, aids in crowd control, and always has a duvetyn fire retardant blanket on hand "just in case". Sasha can work with your local fire department to acquire any permits that may be necessary to perform at your venue.